Areas of Practice. Education. Professional Affiliations. 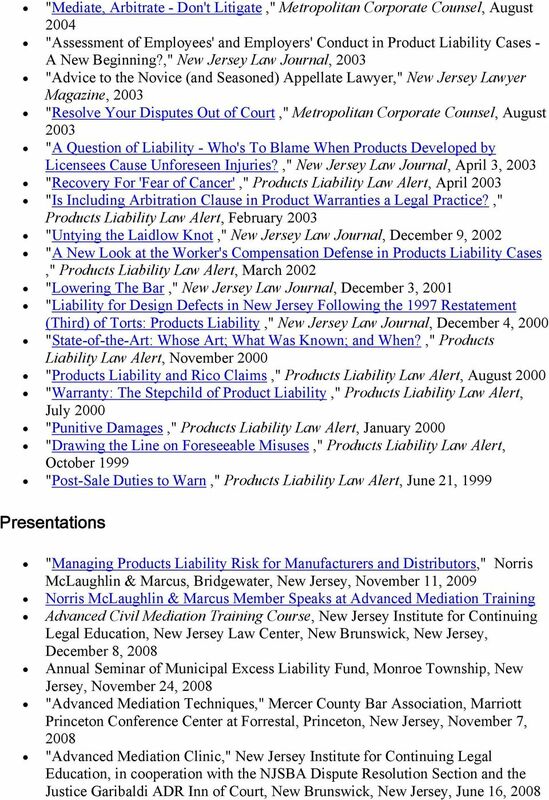 Download "Areas of Practice. Education. Professional Affiliations. 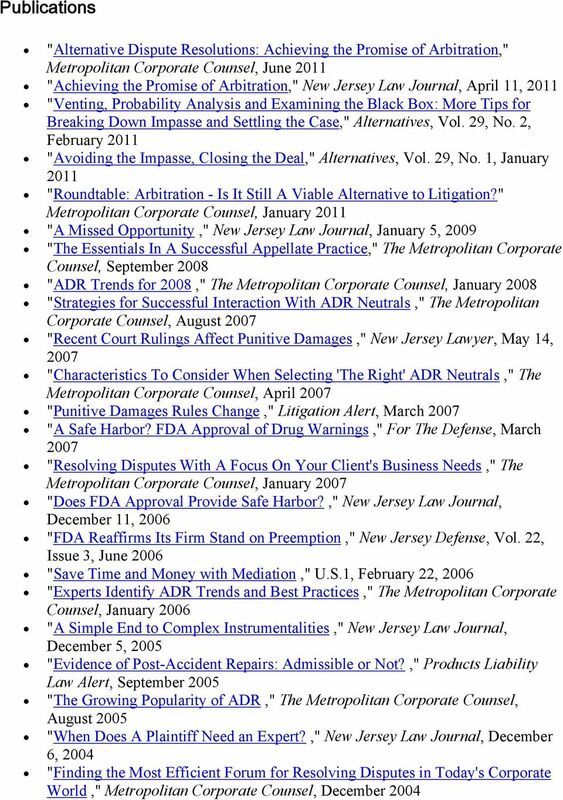 email: wadreier@nmmlaw.com"
4 Chancery Practice from 1983 to 2008, as well as earlier texts on Secured Financing. 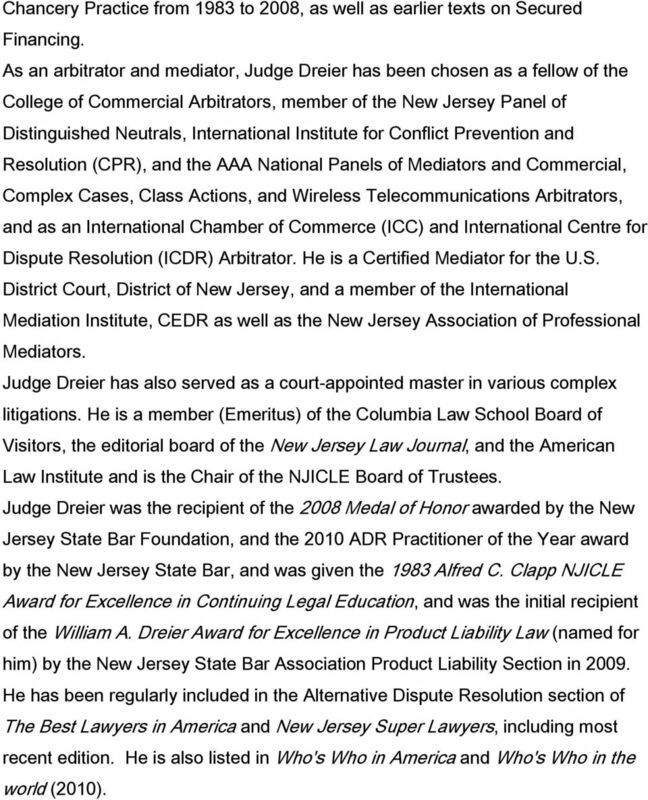 As an arbitrator and mediator, Judge Dreier has been chosen as a fellow of the College of Commercial Arbitrators, member of the New Jersey Panel of Distinguished Neutrals, International Institute for Conflict Prevention and Resolution (CPR), and the AAA National Panels of Mediators and Commercial, Complex Cases, Class Actions, and Wireless Telecommunications Arbitrators, and as an International Chamber of Commerce (ICC) and International Centre for Dispute Resolution (ICDR) Arbitrator. 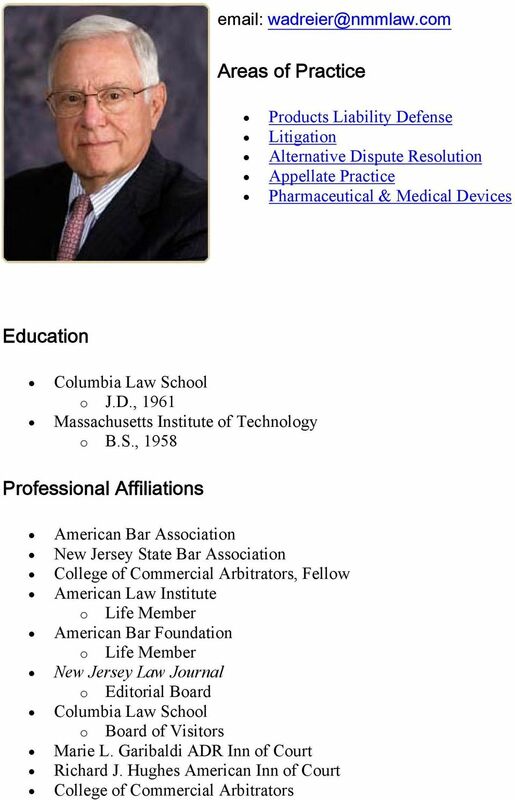 He is a Certified Mediator for the U.S. District Court, District of New Jersey, and a member of the International Mediation Institute, CEDR as well as the New Jersey Association of Professional Mediators. 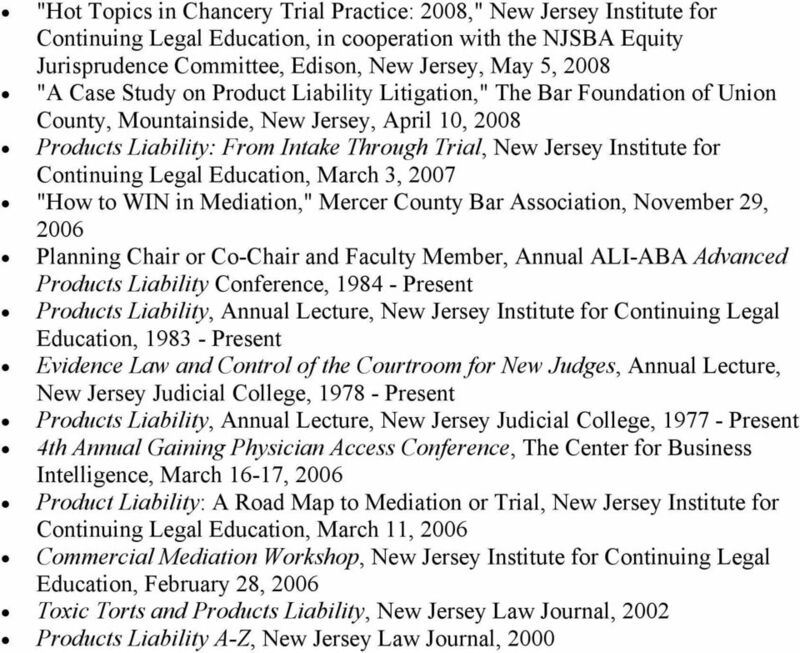 Judge Dreier has also served as a court-appointed master in various complex litigations. 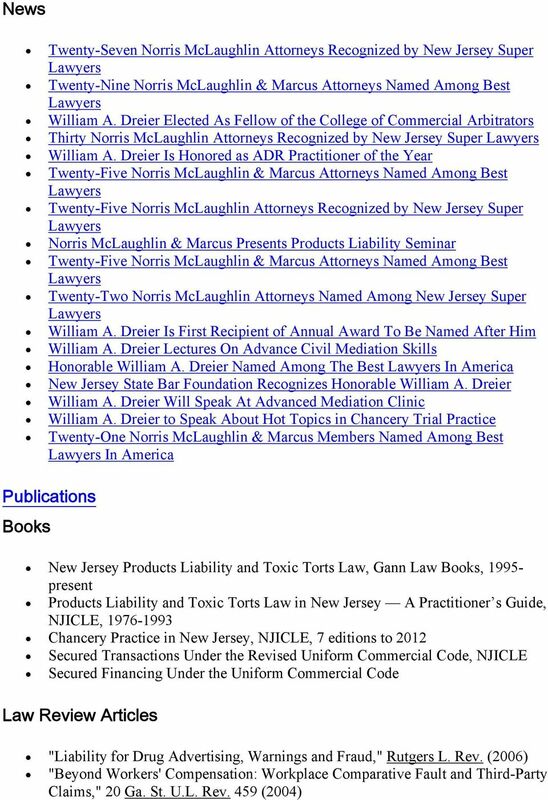 He is a member (Emeritus) of the Columbia Law School Board of Visitors, the editorial board of the New Jersey Law Journal, and the American Law Institute and is the Chair of the NJICLE Board of Trustees. 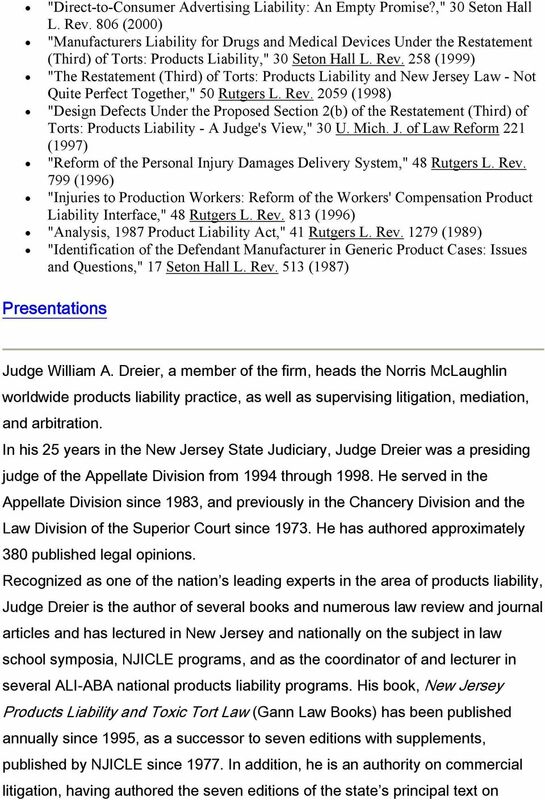 Judge Dreier was the recipient of the 2008 Medal of Honor awarded by the New Jersey State Bar Foundation, and the 2010 ADR Practitioner of the Year award by the New Jersey State Bar, and was given the 1983 Alfred C. Clapp NJICLE Award for Excellence in Continuing Legal Education, and was the initial recipient of the William A. Dreier Award for Excellence in Product Liability Law (named for him) by the New Jersey State Bar Association Product Liability Section in He has been regularly included in the Alternative Dispute Resolution section of The Best in America and New Jersey Super, including most recent edition. He is also listed in Who's Who in America and Who's Who in the world (2010). Practice (1998) His book, Mediation Career Guide, was published in 2001 has been a bestseller on Amazon in mediation since its release. Edward J. Bergman, Esq. Bergman & Barrett P.O. Box 1273 Princeton, N.J. 08542 (609) 921-1502 e-mail: Ejb@gear3.net. Education.